The 2013 agenda privileges operator and enterprise scenarios and testimonies. 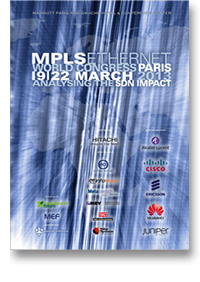 Particular attention will be paid to SDN and OpenFlow issues: what aspects of MPLS are impacted by SDN interfaces. 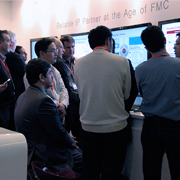 Other sessions will cover End-to-End, Mobile backhaul, Protection and Core networks technical issues. The contributions have been analyzed and categorized according to their degree of pertinence by the members of the scientific committee. Upperside Conferences would again like to thank the members of the committee for their commitment and support. The sessions will be addressed by MEF ambassadors. The sessions will be addressed by Broadband Forum ambassadors. The demographics of congress delegates show vigorous internationalization and a very solid presence of service providers. At the 2012 event, representatives from the EU made up 48 %, followed by attendees from North America at 18% and 11% from Russia. 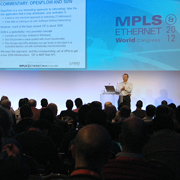 With carriers from more than 70 countries participating at the event, MPLS & Ethernet World Congress can claim to be the first international event in this realm. During the MPLS & Ethernet World Congress, the EANTC, in collaboration with Upperside Conferences, will organize the first ever public European multi-vendor SDN interop event, and the first one worldwide focusing on service provider wide area requirements. The tests were performed and verified in detail at a closed doors hot staging at EANTC lab in Berlin. The successful results of the tests were documented in a white paper released by EANTC during the congress.